“WE CAN’T SAVE Brazil by killing old people,” says Jair Bolsonaro, Brazil’s next president. He is referring to the country’s main public-policy problem: a bill for pensions that eats up more than half of the federal budget and is growing at a rate four percentage points above inflation. He is not the only person in the incoming administration to have expressed ambivalence and a lack of urgency about reining the spending in. “We have four years to do it,” says Onyx Lorenzoni, his chief of staff. And yet many are betting Mr Bolsonaro will act speedily to solve a problem that has bedevilled Brazil for years. Their optimism stems from his pick for economy minister: Paulo Guedes, who studied at the University of Chicago and co-founded BTG Pactual, Brazil’s foremost home-grown investment bank. Investors are placing their faith in him to lead the fiscal adjustment of 4-5% of GDP required to stabilise the public debt, and the liberalising reforms needed to rekindle growth after a recession in 2015-16 that wiped 7.3% off GDP. The outgoing president, Michel Temer, managed some fiscal reforms, notably a cap on federal spending and cuts to subsidised lending. But pensions defeated him, after he looked likely to get caught up in a corruption investigation that had already entangled many lawmakers. This year’s election pitted Mr Bolsonaro, a law-and-order candidate only lately converted to economic rectitude, against Fernando Haddad, a left-wing acolyte of Luiz Inácio Lula da Silva, a jailed former president. During the rancorous and unpredictable campaign, reforms were put on hold. Investors decided to “wait the whole thing out”, says Tony Volpon of UBS, a bank. Now they are celebrating, perhaps prematurely. The currency, pummeled in the past two years, staged a rebound (see chart 1). 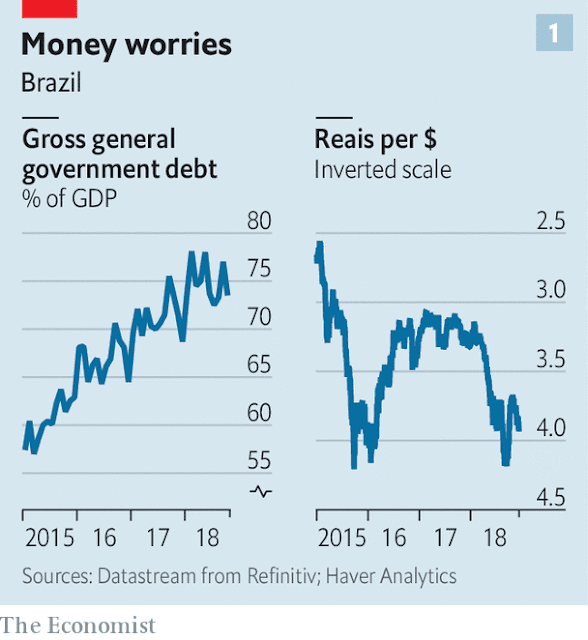 Since Brazil has healthy foreign-exchange reserves and its lowest inflation rate for decades, progress depends not on global financial markets or institutions, but on politicians in Brasília. That is both encouraging and worrying. “To reform the system, you have to be inside it,” says Ana Carla Abrão of Oliver Wyman, a consultancy. But insiders have resisted reforming pensions for years. Their generosity dates from the transition from dictatorship to democracy in the 1980s. The pressure to keep them generous is “unimaginable”, says Fernando Henrique Cardoso, a former president who tried reform in the 1990s. The system was once even more insanely lavish. The government scheme for private-sector workers is heavily subsidised. The public-sector scheme is even more bountiful; civil servants not uncommonly retire in their 50s on full pay. Military pensions are particularly outsize—but they are unlikely to be touched. (Mr Bolsonaro, a retired captain, began drawing a pension at 33.) Such privileged groups are sure to resist reform. According to the treasury, 41% of pension benefits go to the richest fifth of Brazilians, and 3% to the poorest. But an ageing population means the system is unsustainable. There were eight workers for every pensioner in 2000. By 2060 there will be just two, says Paulo Tafner of the Institute for Applied Economic Research, a government-linked think-tank. The government spends 12% of GDP on pensions, compared with an average of 8% in the rich countries of the OECD (see chart 2). Pensions have played a big part in pushing the public debt-to-GDP ratio from 52% at end of 2013 to 74%. Without reform, it could soon pass 90%. A ten-year freeze on federal spending in 2016 slowed the rise in debt. But as pensions continued to swell, they exacerbated the squeeze on public services and investment in infrastructure. Others advocate greater radicalism. During the campaign Mr Guedes proposed a “capitalisation” model, with retired people drawing pensions from savings pots built up while in work. Several schemes, all less daring, are under consideration. A notable one would feature pay-as-you-go for most retired people, but with tighter eligibility rules; a guaranteed minimum pension for the poorest; and a capitalisation system for high earners. According to Mr Tafner, one of its authors, it would save 1.3trn reais over ten years. But recently Mr Bolsonaro has talked of “slicing” reform into stages, starting by introducing a minimum pensionable age. And congress may dilute any scheme further, as it did with Mr Temer’s. Markets will grow impatient if a proposal is not making its way through congress by July, says Arthur Carvalho of Morgan Stanley, a bank. 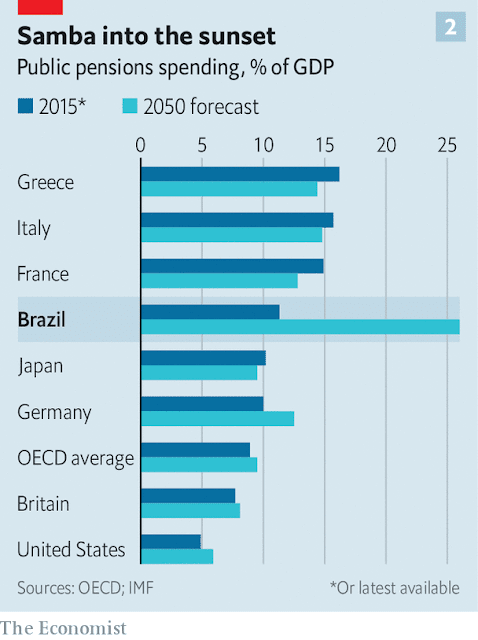 But even the most comprehensive reforms under consideration will not solve all Brazil’s fiscal problems. They would take years to have much effect on spending, since current pensioners would continue to benefit from the old system. Success would, however, increase confidence, lower long-term interest rates and raise hopes for other much-needed reforms. These include privatising inefficient state companies (a one-off deficit-slasher), further cutting subsidised lending (which distorts credit markets and monetary policy) and simplifying a regressive tax system that gives 4% of GDP in concessions to businesses. “It has no rules, only exceptions,” jokes Bernard Appy of the Centre for Fiscal Citizenship, a think-tank. The big question is whether Mr Bolsonaro can bring congress into line. 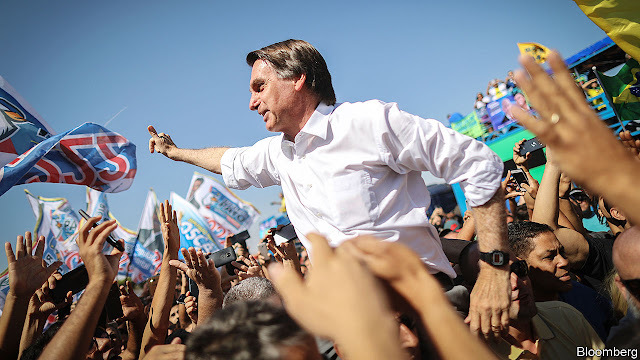 His Social Liberal Party has little more than a tenth of the seats, and he says he will not corral lawmakers in the usual Brazilian fashion, namely by buying off parties with pork-barrel spending and appointments to high-spending ministries. He plans instead to negotiate issue by issue with cross-party interest groups, such as evangelicals, security hardliners and farmers. That may not work. “The caucuses will back him when it comes to their own interests, but when it’s time to vote for pensions reform, each congressman thinks of himself,” says Simone Tebet, a senator from the centrist Brazilian Democratic Movement. Mr Bolsonaro was elected on a platform of abolishing privileges, so he must emphasise that message to bring pressure to bear on congress, says Arminio Fraga, a former central-bank director who worked with Mr Tafner on pension reform. But Mr Bolsonaro and Mr Guedes had early warning of how hard their task will be when they failed to dissuade the outgoing congress from increasing public-sector pay by 16%, far above inflation. Meanwhile, an auction for oil-exploration rights hit a snag after Mr Guedes offered to share the revenue with the states, only to back-pedal after realising this would bust the spending cap that was Mr Temer’s main achievement. Congress, sensing an opportunity, refused to approve the auction without getting a cut. The new economic team is committed to reform and conditions are favourable, says Eduardo Guardia, the outgoing finance minister. But, he adds with some understatement, “There is execution risk.” Others are heartened that, after so long, pension reform leads the next president’s agenda. “Debate about the allocation of government spending has never happened before in Brazil,” says Mr Carvalho. “What is a priority? Do you take from teachers, from judges, from farmers or from families?” The answer—“All of them”—is unpalatable. But it is the one Brazil needs. The business corporation is among the most remarkable of all human innovations. Corporations are warring armies battling for supremacy in markets. The resulting symbiosis between command and competition has proved very fruitful. The unprecedented economic development seen since the middle of the 19th century would have been impossible without the resources and organisational capacities of that great invention — the limited liability joint-stock company. 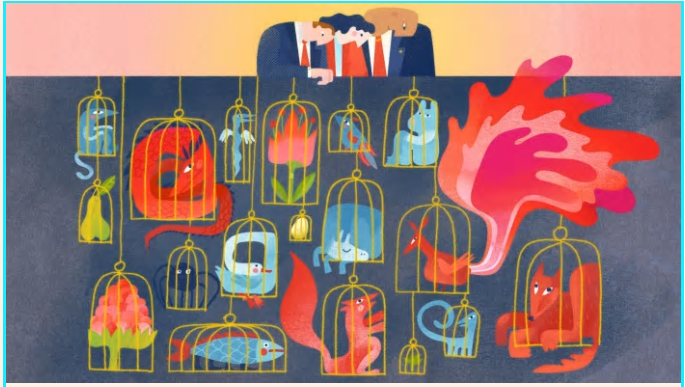 Yet, as Colin Mayer of Oxford university’s Saïd Business School argues in a remarkable and radical new book, Prosperity, all is not well with the corporation. The public at large increasingly views corporations as sociopathic and so as indifferent to everything, other than the share price, and corporate leaders as indifferent to everything, other than personal rewards. Judged by real wages and productivity, their recent economic performance has been mediocre. Furthermore, corporations have been allowed to corrode competition, as Jonathan Tepper and Denise Hearn argue in another important new book, The Myth of Capitalism. In short, bad ideas have seized the corporation and let competition waste away. Prof Mayer’s main target is Milton Friedman’s argument that the purpose of companies is only to make profits, subject to law and (minimal) regulation. Today, this is presented as the obligation to maximise shareholder value. Behind this is the view, which goes back to Adam Smith, that the principal challenge is the “agency problem” — the relationship between owners and agents (the managers). “The problem with the Friedman view,” insists Prof Mayer, “is that it is hopelessly naive.” It is based on “simple and elegant economic models that simply do not hold in practice”. The idea that businesses pursue profits and only profits, can, he argues, only produce bad businesses and dire outcomes. This is so for three reasons: human, social and economic. The first is most important. Profit is not itself a business purpose. Profit is a condition for — and result of — achieving a purpose. The purpose might be making cars, delivering products, disseminating information, or many other things. If a business substitutes making money for purpose, it will fail at both. Second, when legislators allowed incorporation of limited liability companies, they were not thinking of profits, but of the economic possibilities afforded by huge agglomerations of capital, effort and natural resources. Not least, the long-term commitments embedded in the corporation allow it to focus on innovation: arguably, the most important contribution of the corporation is to make innovation routine. Finally, the core theory of the firm is that of the late Ronald Coase, who argued that the market could be a less efficient way of organising production than a hierarchical organisation, because of transaction costs. This is another way of saying that markets are incomplete, especially where long-term commitments are concerned. Yet it is quite illogical to argue that one can ignore this radical market incompleteness when deciding how businesses should be run. If the rationale for the corporation is to substitute relational contracts, and so trust, for explicit contracts, and so enforcement, one cannot ignore this in deciding what businesses are for and who should control them. How, above all, can such long-term trust be sustained if the constantly reiterated aim of the corporation is to serve the interests of those least committed to it, while control is also entrusted to those least knowledgeable about its activities and at least risk of damage by its failure? Yet these are reasonable descriptions of the place of shareholders in publicly-owned companies with widely-distributed shareholdings. Shareholders are least committed, because, unlike employees, dedicated suppliers and the locations in which businesses operate, they can divest themselves of their engagement in the company in an instant. Shareholders are the least knowledgeable, because they are not engaged in the activity of the company. Crucially, contrary to economic wisdom, shareholders are not, in the actual world, the bearers of the residual risks in the business (other than relative to bondholders). The incompleteness of markets ensures that employees, suppliers and locations also bear substantial risk. Moreover, stock markets allow shareholders to diversify their risks across the world, something employees, for example, cannot hope to do with respect to their company-specific capital stock of knowledge and personal relationships. Moreover, everybody else is at risk from shareholders’ opportunistic behaviour. This has to weaken the commitment of everybody else. In addition, given the mantra of shareholder value maximisation and the inability of shareholders to monitor management, rewards have increasingly been linked not to the performance of the business in delivering on its purposes, but to accounting profits and the share price. Yet both are subject to manipulation. Some would argue that the result has been excessive remuneration, (the theme of Are Chief Executives Overpaid? by Deborah Hargreaves) and chronic under-investment, too. These books suggest that capitalism is substantially broken. Reluctantly, I have come to a similar conclusion. This is not to argue for the abandonment of the market economy, but for better companies and more competition. The implication of Prof Mayer’s book is that the canonical Anglo-American model of corporate governance, with equality among shareholders, widely distributed share-ownership, shareholder value maximisation and the market in control is just one of many possible ways of structuring corporations. There is no reason to believe it is always the best. In some cases, it works. In others, such as highly-leveraged banking, it really does not. We should be explicitly encouraging a thousand different flowers of governance and control to bloom. Let us see what works. At the same time, the implication of Mr Tepper’s book is that, just as we have been too careless in thinking about the nature and purpose of the corporation, so, too, we have been careless about the markets in which they are embedded. The bigger the corporations, the more competitive must be the markets. The corporation is indeed a great invention. But what has made their contribution so remarkable has, above all, been the competitive markets in which they are embedded. The weaker the competition, the less their profits will tell one about a company’s real economic contribution. We must fix the corporation and competition, together. Who’s Afraid of China’s Influence? What is most notable about China’s efforts to spread its influence abroad is not their success, but the ease with which they are exposed. Portraying these efforts as a genuine threat to the world's democracies not only betrays the West’s insecurity, but also gives China more credit than it deserves. 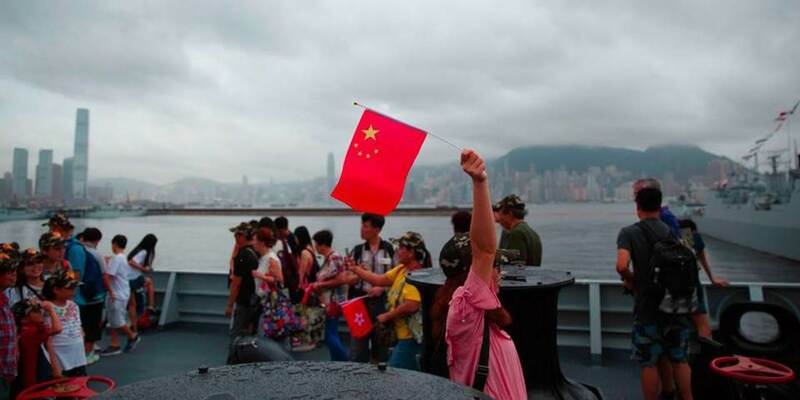 HONG KONG – Since the Cold War ended, the West has invested huge amounts of resources in efforts to induce political liberalization in China, including through programs to promote the rule of law, civil society, transparency, and government accountability. The results have been disappointing. Far from becoming more democratic, China has lately been backsliding toward hard-line authoritarianism. And now it is investing resources in efforts to do some inducing of its own in the world’s democracies. China’s influence-peddling in the West has been the subject of media reports and think tank studies, and has elicited the concern of high-profile politicians, from US Vice President Mike Pence to former Australian Prime Minister Malcolm Turnbull. China’s “influence operations,” they argue, include cultivating ties with Western politicians, establishing Confucius Institutes around the world to promote Chinese language and culture, expanding the global reach of China’s official propaganda networks, and donations to and exchange programs with academic institutions. How should Western liberal democracies confront a China that is taking a page from their own playbook, as it exploits their openness to advance its ideological and geopolitical objectives? For starters, Western leaders and institutions should distinguish between state-sponsored activities and legitimate, mutually beneficial cultural, civic, and educational exchanges among private citizens and entities. To be sure, the Communist Party of China’s sophisticated “United Front” operation – which focuses on neutralizing opposition to its policies and authority, inside and outside China – often relies on private citizens to achieve its objectives. Private actors also have informal incentives to curry favor with China’s rulers by behaving in CPC-friendly ways. As a result, even ostensibly independent or private activities can carry political and reputational risks for Western organizations, which may be accused of acting as “agents of influence” for China. But that does not mean that Western entities should reject outright any opportunity for cooperation with Chinese entities and individuals. Such an approach would not only cause Western organizations and individuals to miss out on valuable opportunities; it also would strengthen the CPC’s capacity to control the flow of information, manipulate public opinion, and shape popular narratives. In fact, transparency is one of the most powerful mechanisms for protecting Western democratic processes from Chinese influence operations. For example, public-disclosure requirements regarding the sources and conditions of donations to politicians, political parties, and civic and academic institutions, as well as ownership stakes in media assets, would make it much harder for the Chinese government to exert its influence through ostensibly private actors. A shared code of conduct for dealing with China would also help to ensure that democratic values are upheld in any deal or collaboration. Upholding these values also means that Western governments must take care to avoid another kind of overreaction: targeting their societies’ own citizens of Chinese origin. Given China’s long record of exploiting its diaspora for economic and political gain, some in the West will be tempted to look upon all ethnic Chinese with suspicion, exposing them to discrimination and potentially even subjecting them to surveillance. But allowing ethnic Chinese to be harassed, intimidated, or punished for exercising their civil and political rights – say, by making political donations or speaking out on issues that matter to them, including those related to China – would be a grave injustice. It would also be self-defeating strategically: the soft but intense power of the democratic values that the West claims to defend constitutes the most effective defense against Chinese influence operations. Western institutions benefit from unparalleled resilience, thanks to the liberal-democratic values that underpin them. They cannot be easily subverted by an authoritarian regime, no matter how many cultural exchanges or language institutes it builds. In fact, what is most notable about China’s efforts to spread its influence abroad is not their success, but the ease with which they are exposed. Portraying them as a genuine threat to the world’s democracies not only betrays the West’s own insecurity, but also gives China more credit than it deserves. Minxin Pei is a professor of government at Claremont McKenna College and the author of China’s Crony Capitalism. Despite all the ominous press being devoted to the soon-to-be-inverted yield curve, it’s not always clear why such a thing matters. In other words, how, exactly does a line on a graph slipping below zero translate into a recession and equities bear market, with all the turmoil that those things imply? The answer (which is both simple and really easy to illustrate with charts) is that banks – the main driver of our hyper-finacialized society – still make at least some of their money by borrowing short and lending long. They take money that’s deposited into savings accounts and short-term CDs (or borrowed in the money markets) and lend it to businesses and home buyers for years or decades. In normal times long-term rates are higher than short-term to compensate lenders for tying their money up for longer periods. The banks earn that spread, which can be substantial if borrowers make their payments. When the yield curve flattens and then inverts — that is, when short rates exceed long rates — banks lose the ability to make money this way. They lend less, which restricts building and buying and spooks the broader markets. And here’s how bank stocks are behaving in response. The following chart is for the BKX bank stock ETF that includes all the major US banks. Note how it was stable for the first nine months of the year and then fell off a cliff as it became clear that the yield curve really was going to invert. The U.S. Treasury yield curve will invert next year, possibly within the next six months, much earlier than forecast just three months ago, with a recession to follow as soon as a year after that, a Reuters poll showed on Thursday. The two-year Treasury yield is forecast to rise to 3.20 percent in the next 12 months, from around 2.78 percent on Wednesday, according to the Reuters poll of more than 70 bond market strategists taken Dec. 6-12. The 10-year bond yield was expected to rise to 3.30 percent from about 2.90 in a year. While that would put the yield spread between the two-year and 10-year Treasuries in a year around where it is now, at around 10 basis points, about 40 percent of respondents forecast that gap to be zero or negative in the next 12 months. Just in the last three months, the yield spread has collapsed by two-thirds from just over 30 basis points. That has coincided with one of the most tumultuous periods on global equity markets since late August. Thirty of more than 40 strategists who answered an extra question expect the 2s-10s yield spread to become negative in the next 12 months, including 15 who said within the next 6 months. Half of 26 strategists in the poll expect a U.S. recession to follow that inversion within the next two years. While there is no set pattern on how long it takes for a recession to hit once the yield curve has flipped, it took about 18 months before the last deep recession about a decade ago. The conclusion: Sentiment in the bond market – and by implication the broader economy – took a huge hit in the past couple of months. And since in a fiat currency system sentiment is everything, it should be no surprise that banks are down and taking the rest of the stock market along for the ride.